Marcelo Ertorteguy and Sara Valente want you to do more than just admire their architectural designs from afar–they want you to hear them. 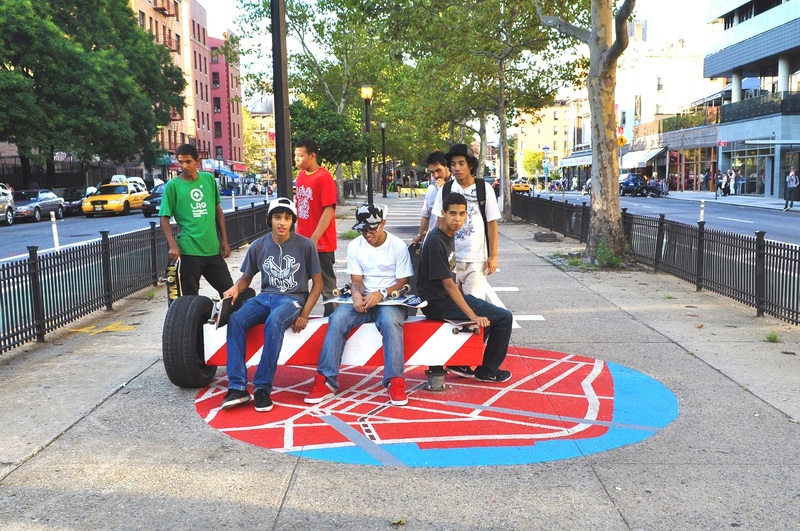 The Venezuelan-born designers are the brains behind the creative firm Stereotank, where they create public art installations that fuse the disciplines of architecture, music, environmental sciences and much more. 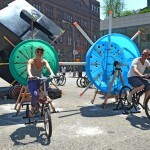 From Taku-Tanku, a traveling, floating house made out of water tanks, to HeartBeat, an urban drum installation currently on view in Times Square, all of Stereotank’s innovative work takes a fresh and playful approach to socially conscious designs that engage their audiences. We recently chatted with Marcelo and Sara about how they developed their unique design philosophy and what their creations mean to them and New Yorkers. Tell us a bit about your schooling in Venezuela and how you became so passionate about the relationship between architecture and music. Sara: During my architecture school years I became increasingly interested in public space and how people live within urban settings and deal with neglected spaces. Then I met Marcelo and learned about the work he was doing with music, and the idea of exploring sound creation as an urban, social, and creative tool got triggered. What made you decide to come to NYC? Sara and Marcelo: After graduating from architecture school in Venezuela, we wanted to get a Master’s degree and have an experience abroad. Our options were Europe or New York, and after looking at architecture schools and their programs we decided to go to Columbia University. New York definitely has no shortage of noises and sounds. Does the city itself influence your work? 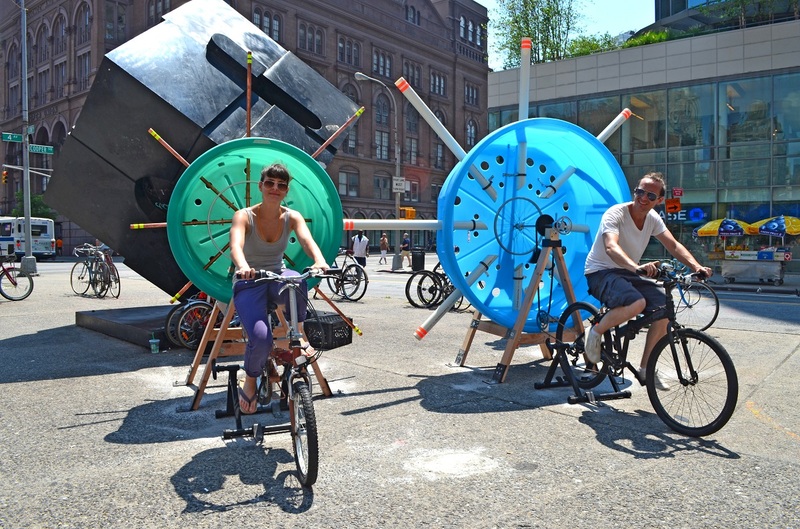 Sara and Marcelo: There’s no doubt that New York is a very noisy city, but more than this being something that inspires us, it is something that actually compels us to understand how to re-introduce sound in the city without getting lost in its cacophony. 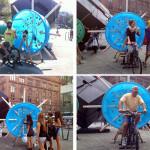 Projects like Cyclo-phone–where we used the bicycle as a theme that was relevant to the Summer Streets festival and turned it into an instrument to make music by pedaling–or performances such as Nevermind the Bollards–where mundane steel bollards were used to make music–demonstrate how objects found in the city itself can contain sound properties that can be harnessed to compose and perform music and open up a new dimension for people. It was very interesting for us to see the reaction of people who lived or worked in the neighborhood. They were surprised and grateful to see another point of view. 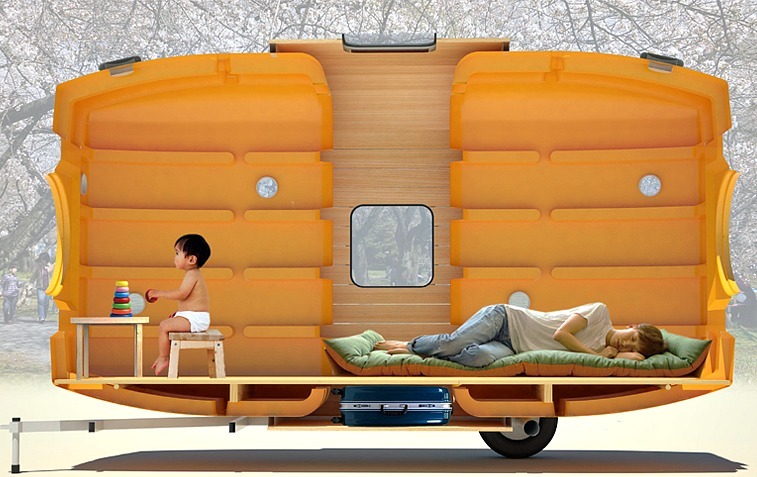 We first featured Stereotank on 6sqft when we came across Taku Tanku, your floating sleeping shelter made from recycled water tanks. You noted that you see the piece as a sculpture that “celebrates the vital role of water in our lives.” How does that come through in the design? 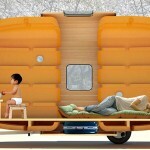 Sara and Marcelo: Taku-Tanku was the result of a specific program for a competition about “Little Houses” in Saitama, Japan. The competition brief encouraged participants to propose a Little House that not only functioned as a house but also as an art installation, conveying a message. Having found these beautiful large water tanks with the potential for being inhabited, the conceptual idea was not to fill the tanks with water (as they were designed for) but to fill them with “life,” turning them into a home. 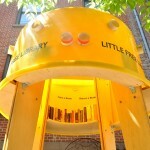 The Little Free Library that you designed for the St. Patrick’s Old Cathedral School in Nolita in 2013 was also constructed out of a yellow water tank. What makes you so fond of the material? Sara and Marcelo: We love giving new function to existing objects and making use of the features they have been engineered to perform. Plastic tanks have become one of our favorites not only because of their different forms and the way they are made to “contain,” but also for their material properties, the simplicity of operating them, the wide range of colors, the translucency of plastic, and the fact they are designed for water storage, which makes them a perfect object for outdoor use. 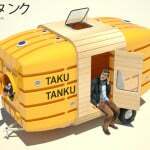 Additionally, tanks have very good acoustic properties, offering great potential for musical instruments. 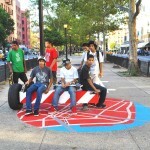 We also featured HeartBeat, your winning design for the annual Times Square Valentine Heart Design contest. How did you arrive at the concept? Sara and Marcelo: We knew about the Times Square Valentine competition held every year on Duffy Square, but we never thought of ourselves designing anything “heart-shaped.” When we were invited to participate in the competition we said, “Ok, now we have to actually design a heart!” So, the first thing we did was look at the sonorous side of a heart, and then the concept became clear literally in a heartbeat. Next, we started looking for an object (conveniently a water tank) that could have its form altered into a heart shape, and we came across the perfect tank that, by a simple operation of cutting off a section at an angle and combining it with its mirror image, created the form we were after. The rest was to give new functions to the different parts of the tank: the manholes became slots to position the drums; the corrugation of the plastic became the place to equally space and locate the xylophone bar keys and the pvc pipe organ; and the inlet holes became light lenses. 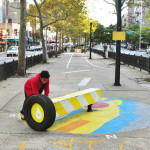 How do you expect New Yorkers will interact with the piece? 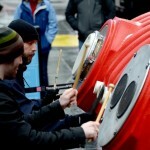 Sara and Marcelo: HeartBeat is an urban drum, so we expect people to go and bang the drums! 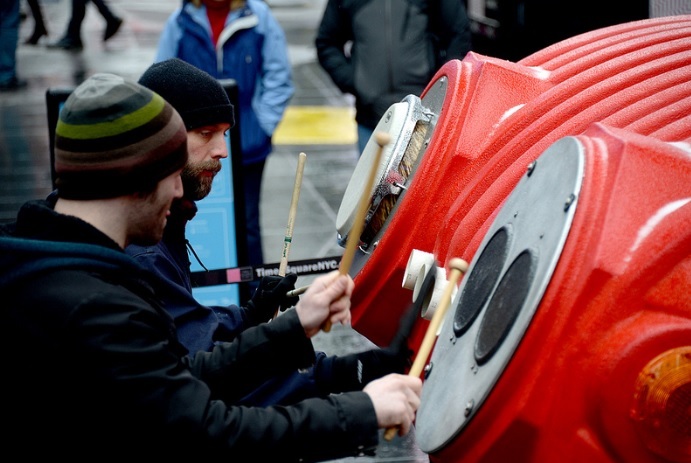 The installation is flexible enough so non-musicians can go and have fun, but it’s also designed for musicians to bring their mallets and make music experimenting with the instrument. Being a heart shape in the middle of Times Square during Valentine’s Day we also expect millions of sweethearts from all over the world to go get photographed in front of the heart and play with it. Do you have a favorite piece you’ve created? Sara and Marcelo: We love all our children the same. With each installation we explore a different interest, object, action, material, and, while many of our installations are sound oriented, others focus on other participatory aspects or on re-interpreting functions given by the program, site, or other conditions. 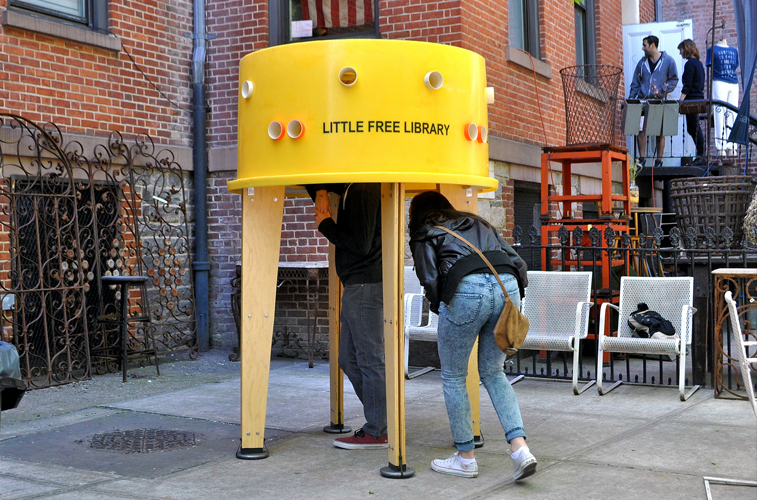 Examples of this are the compass bench we created for Mall-terations, a project we did in collaboration with Combo Colab and Hester Street Collaborative where seating allowed for playful movement and a 360-degree experience of the space; and the Little Free Library in Nolita, with its singular access and book storage. Are there any upcoming projects you can tell us a bit about? Sara and Marcelo: HeartBeat will be transformed into a different shape and program a week prior to its closing as part of its afterlife agenda in an effort to find a home for it where it can continue to be used and enjoyed by the public. Keep an eye on it the first days of March! Why do you find your work with Stereotank so personally fulfilling? 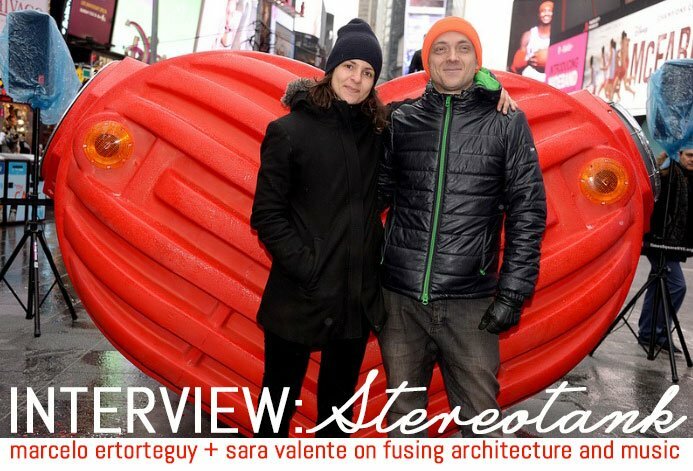 Sara and Marcelo: We started Stereotank as an exploration between architecture and sound with the idea of creating sound instruments that could be inhabited and played from within, and we discovered that we wanted to “play” buildings and “inhabit” musical instruments. The result is a series of hybrid objects that combine properties of both disciplines, but meld together and form their own identities. We realized that the intersection between these objects reflected back to the meaning of what Stereotank is and what it means to us; we like to see Stereotank as the intersection of an architectural studio and a rock band, and its experiments and installations give us the fulfillment that a song or a record give to a musician–the pleasure of creation.